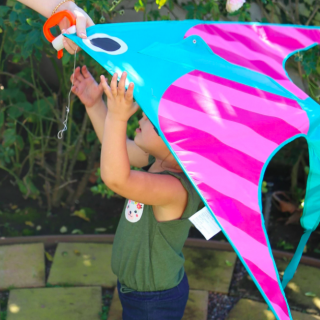 Summer may means school is out, but it also means hungry kids are home and ready for lunchtime fun! 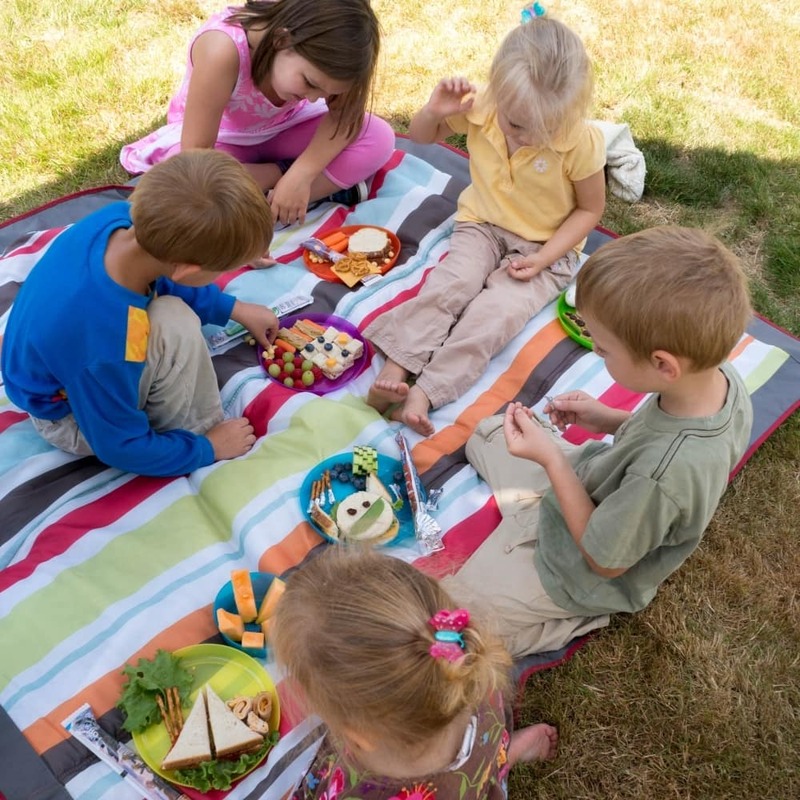 To mix up your summer lunches, try one of these 5 creative lunchbox ideas with your kids! Whether you have a sports star, an outdoor nut, a gamer, or a child with a big imagination these lunchbox ideas will be a hit! When you’re planning your summer lunchbox, keep a handful of Go-Gurts ready! They are easy to serve and perfect for adding in a serving of dairy to your child’s lunch without fuss. Weave the Go-Gurt right into the lunch theme when you can to add even more fun to your child’s lunch. 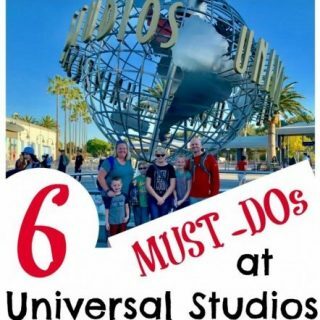 Here’s my top 5 ideas! Create your own all-star Basketball Lunchbox with just a few simple ingredients! I created a simple PB&J sandwich and then used a circle cookie cutter to cut the outside shape to create a basketball. Next, take a knife and slice evenly down the center of the sandwich. Finally, use the circle cutter again at the edges of the circle to create an inward curve cut to form your basketball. A Go-Gurt makes the perfect basketball hoop pole. Just add a slice of cheese and a few pretzels to represent your hoop and backboard. 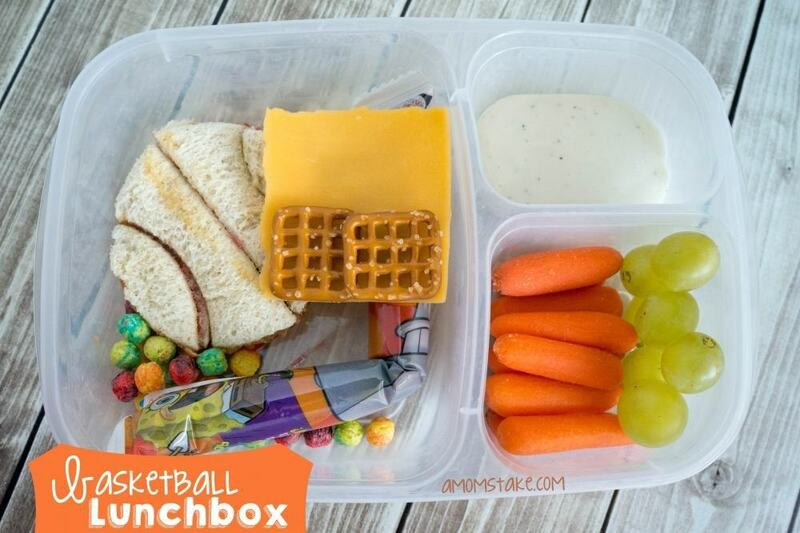 Make sure you include a handful of Trix to represent tiny basketballs for a fun and interactive lunchbox. Round out your lunchbox with carrots and ranch for a real slam dunk lunchbox! 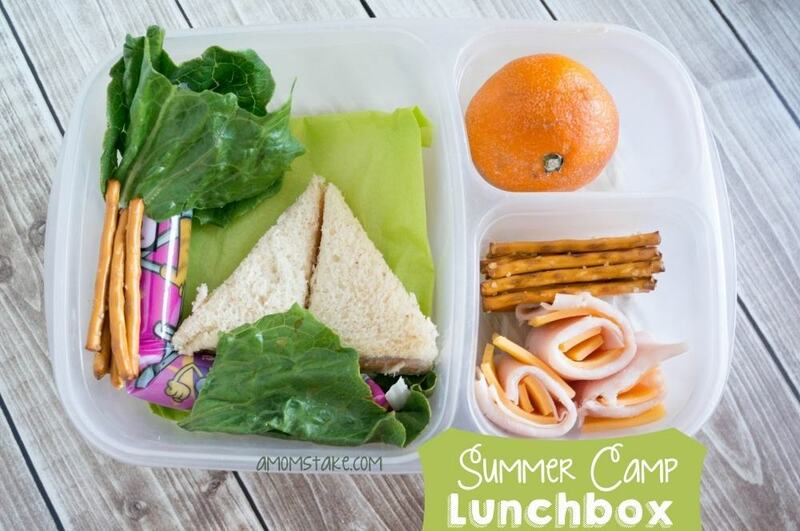 This fun themed summer camp lunchbox will remind your kids of all the fun they had at camp. Grab a leafy lettuce to use as a tree and grass. Finish off the tree with a few pretzels as the trunk. Next, cut a sandwich into two triangles to resemble a tent or A-frame cabin. Turkey and cheese pinwheels will resemble sleeping bag rolls to add to the scene. A mandarin orange resembles the bright sun! Summertime means lots of time for fun and games – which is what this Tic Tac Toe Lunchbox is full of! Cut a PB&J sandwich into a 9-square grid to resemble your Tic Tac Toe board then top with game pieces your child can interact with like blueberries and cubed cheese. Raspberries and grapes will resemble the favorite dot game. Add in a Go-Gurt and alternating carrot and peanut butter filled celery sticks to complete this lunch. Let your child’s imagination soar with this Star Wars themed lunchbox. The star of this lunchbox is a Go-Gurt turned light saber! Just add a small piece of aluminum foil as a handle at the base of your Go-Gurt. Next, add in a Yoda sandwich to show your allegiance to the Jedi’s. A turkey, cheese, and leafy lettuce sandwich looks great as it will show off green just like Yoda. Just use a circle cookie cutter to form the face and add ears from the sandwich scraps that remain using two small triangles. Raisins and a peapod can form his eyes and mouth. Round out the lunchbox by adding mini light saber pretzels, blueberries to form a galaxy and cucumber slices. 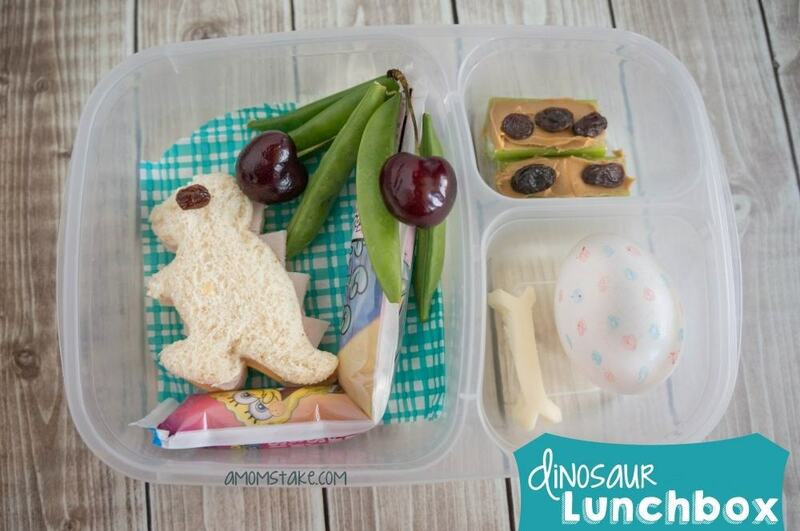 Send your child back in time to prehistoric days with this dinosaur themed lunchbox! Cut out a dino using a dinosaur shaped cookie cutter and then add an extra slice of lunch meat folded in half and then cut triangle spikes along the edge before tucking the slice of meat into the sandwich. Grab a Go-Gurt to resemble a tree trunk and top with peapods and cherries to make an ancient fruit tree. Add character to the lunchbox with a hard-boiled egg colored with spots as a Dinosaur egg and a string cheese cut into the shape of a bone. Finally, add in more veggies and fun by making ants on a log with a piece of celery, peanut butter, and a few raisins. I made one of each of these lunchboxes for a fun backyard summer lunch dates with my nieces. The kids absolutely loved picking out a lunchbox and sometimes swapping something from their own plate with their cousins. They all thought the creative lunchbox ideas were so much fun and they each had their own favorite. 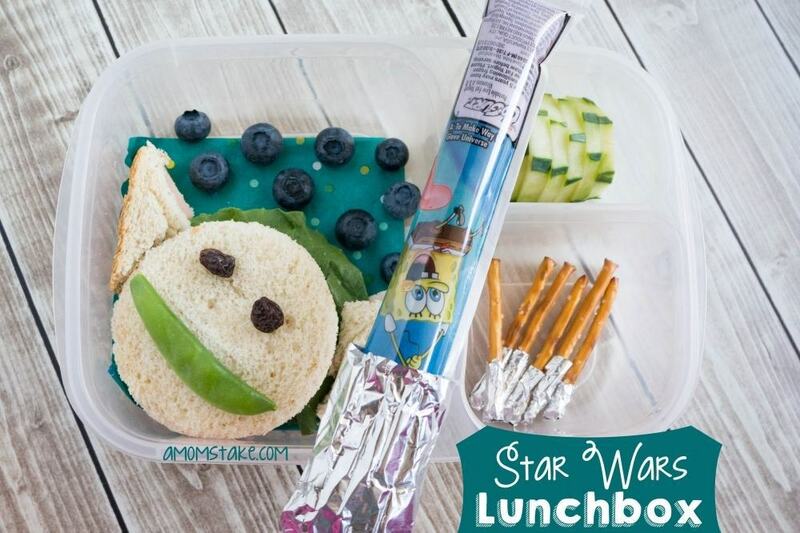 Which is your favorite of these creative lunchbox ideas? Lol great and beautiful ideas! loved star wars the most! These are so cute and creative. I just love that tic tac toe lunch! Thank you for linking at the In and Out of the Kitchen Link Party. Hope to see you again next week. These are absolutely adorable! I want to share on my food page on Facebook: Cooking On A Budget! Great ideas! 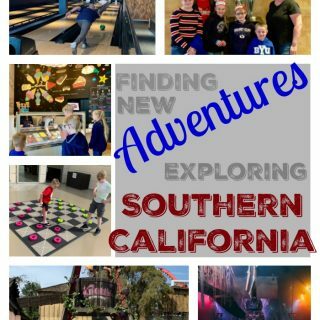 I love to do something fun for the kids. Such cute lunch ideas! Makes taking your own lunch so much better!! Love them all I am such a sucker for a fun lunch box. What great ideas. I love the Star Wars box. It is too cute. All of them are great. So many great ideas! Love the Yoda sandwich. I can’t believe it’s already time to start packing lunches again. Thanks for the lunchbox inspiration :)! These Lunchbox ideas are beyond cool. What a creative way to do a lunch. I think my favorite is the Dinosaur Lunch. 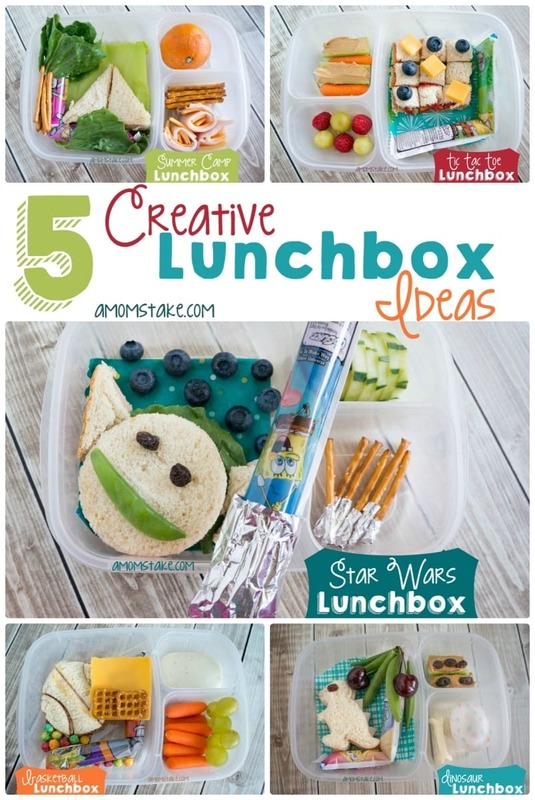 These are great lunch box ideas! Can’t believe I’ll need to be making lunches again soon! 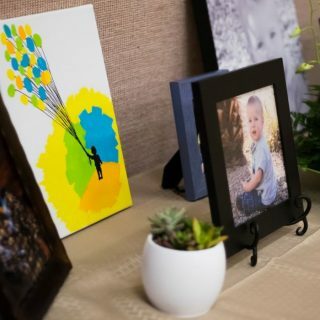 I love all your ideas here. I am thinking of trying to do more fun lunches for the kids this year. I am keeping some of your ideas in mind. I love all the color in the lunch boxes. Beautiful choices. What cute ideas. I so need to do theme lunches with my kids. I am adding that to my bucket list! Very cute ideas! I will be making lunchbox art soon enough myself! I love those lunch box ideas!!! What a creative way to make lunches for your kids. I love the dinosaur lunch. The speckled egg is a great addition to the lunch. Such cute ideas. I really like the Star Wars one and so would my stepson. Very neat ideas! I’m glad you shared. These look fun. These look awesome. Thanks for sharing. I love those ideas! I woulod have loved the dino one as a kid. My toddler now doesn’t care what food looks like- she’s a food monster. BUT I know my nerd-hubby would love the StarWars one as a joke! Oh wow, you are creative! I love the Star Wars one. My lunches never look this cute but you make it look easy! The dinosaur lunch is my favorite! I love the Dino egg and the cute little sandwich. These are fantastic! I am especially loving that Star Wars lunch. I think my favorite is the star wars box. I like that summer one too though! You just won me over with the Star Wars Lunchbox! Seriously my kids would flip for that one! I love the Star Wars one. My son’s heart is going to skip a beat when he opens his lunch to see that I made this for him. He’s a huge Star Wars fan. I’m impressed with your creativity! I especially love the Star Wars and Dino themed ones! Using lunch meat for the dino’s back is brilliant! Wow. You put me to shame. These are amazing. Very creative! 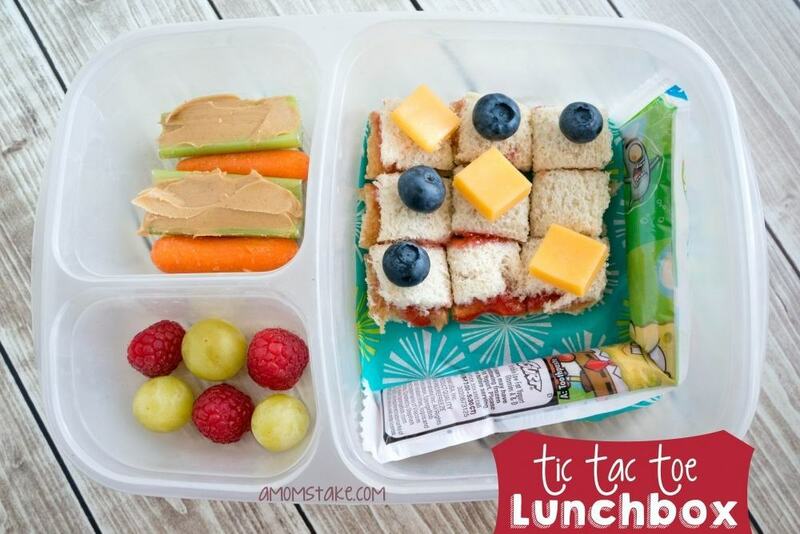 These are such cute lunch ideas. I love the little sandwich squares. These are adorable and healthy. 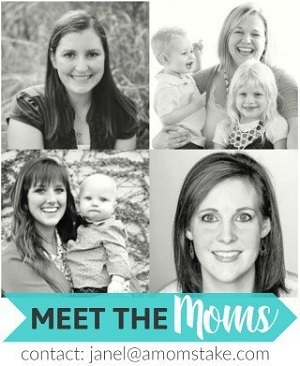 My kids would love them. I like to put Gogurts in the freezer and put them in lunches in the morning. They are cold and sometimes still slightly frozen. yum! My kids always get a kick out of it when I make shapes out of their sandwiches with cookie cutters. Love all of your ideas.